Don’t let cold weather catch you unprepared. Every winter, many homeowners face the expense and inconvenience of frozen water pipes. But you can cross that off your list of winter worries by taking a few simple precautions. Disconnect and drain outdoor hoses. Detaching the hose allows water to drain from the pipe. Otherwise a hard, overnight freeze can burst either the faucet or the pipe where it is connected. Insulate pipes or faucets in unheated areas. If you have pipelines in an unheated garage or cold crawl space under the house, wrap the water pipes before temperatures plummet. Hardware or building supply stores will have good pipe wrapping materials available. Seal off access doors, air vents and cracks. Repair broken basement windows. Winter winds whistling through overlooked openings can quickly freeze exposed water pipes. But don’t plug air vents for your furnace or water heater needs for good combustion. Find the master shutoff. It may be near the water heater or the washing machine. More likely it’s where the water line comes into your house from the street. If a pipe bursts anywhere in the house – kitchen, bath, basement or crawl space – this valve turns it off. So find it now and paint it a bright color or hang a tag on it. Be sure everyone in the family knows where it is and what it does. Call the water company. It is not the homeowner’s responsibility to keep outdoor meter boxes covered and freeze-proof. 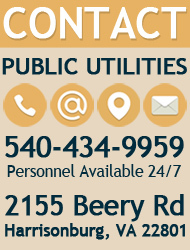 Please call the Public Utilities Department at 540-434-9959 to request an inspection of the meter box if you suspect that the meter has frozen and you do not have water. Optional suggestion: You may leave a pencil-lead-thin stream of water flowing from a bathroom faucet during the worst of a cold spell. Running water has a lesser chance of freezing BUT it may increase your water bill and it could be considered wasteful. What if you wake up one day to find the pipes are frozen anyway? During an extended cold spell, it could happen despite precautions. Do you have the plumber’s telephone number handy? Write it down now before you need it in an emergency. If you think you know where the freeze-up occurred and want to try thawing it yourself, do not under any circumstances use a torch with an open flame! The whole house could catch fire. Also, overheating a single spot can burst the pipe. Heating a soldered joint could allow it to leak or come completely apart. The easiest tool is probably a hair dryer with a low heat setting. Wave the warm air back and forth along the pipe, not on one spot. If you don’t have a hair dryer, you can wrap the frozen section with rags or towels and pour hot water over them. It’s messy, but it works. Be careful because the pipe may already be broken. It’s not leaking because the water is frozen. But when you thaw it out, water could come gushing out. Be ready to run for the master shutoff valve if necessary. The main thing is to take precautions before winter sets in.